Display cabinets are perfect to showcase and store your belongings and are available in solid oak, painted and mango hardwood. Whether buying a display cabinet for your dining room, living room, or hall, our oak, mango, and painted options are a stylish way to put your most treasured ornaments and books on display. Many of our designs incorporate drawers for extra storage space, and you can find large and small cabinets in all kinds of styles – modern to traditional. A decorative way to update your space, they will look great in the hallway, dining room, or living room. 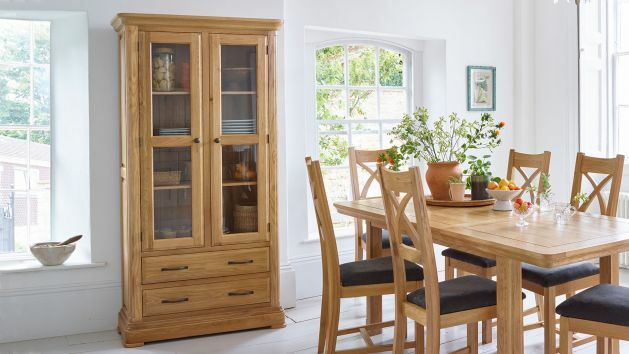 Choose from a range of styles and sizes, from glass door cabinets to tall display units with painted finishes. All our dressers have been built using the finest hardwood to ensure maximum strength and stability. Choose from carefully cut, sustainable mango wood, or A-grade, solid oak, designed to last a lifetime. All our non-painted display cabinets are finished with a wax coating to enhance the natural grain of the wood and protect it from daily wear and tear. Plus, every drawer has been made with real dovetail joints to ensure exceptional longevity. In short, you get quality from top to bottom. Our display units are packed with storage space, with many incorporating several shelves to house all your favourite ornaments. Some of our display units also feature spacious drawers for storing anything from DVDs and video games to crockery and treasured family photos. All our furniture can be delivered free of charge and we won’t say our goodbyes at your front door; we’ll also bring your new purchase to your room of choice. If you’ve had your eye on one of our display units but don’t have the money to pay for it right away, explore our flexible finance options, which give you the option to spread the payments monthly for up to four years.